Bee hives are like factories with production lines, good manufacturing procedures and monitoring and response mechanisms. When all goes according to plan, outputs are as expected. Baby bees are born, the nectar flow is turned into honey and the place is kept clean and tidy, all by the bees. However, when things turn sour like unfavorite weather patterns, invasions or diseases, a colony may succumb very quickly. 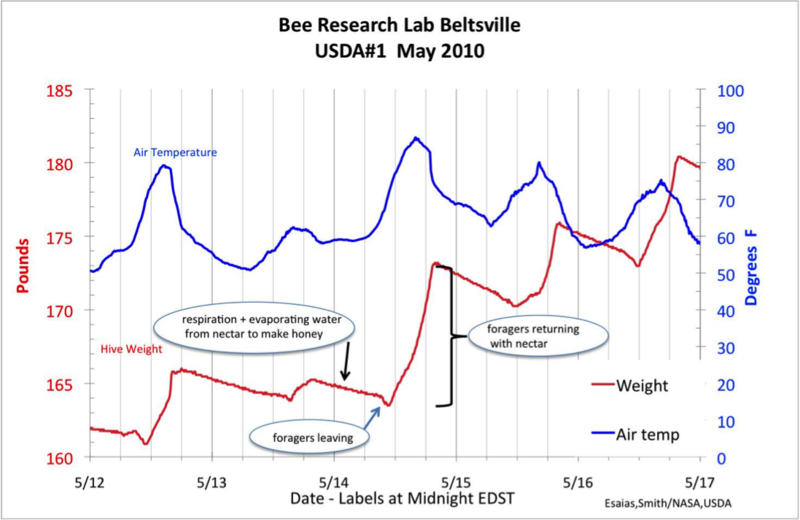 Digital beehive monitoring using remote sensors allows for distant, paperless verification and early warning notification. 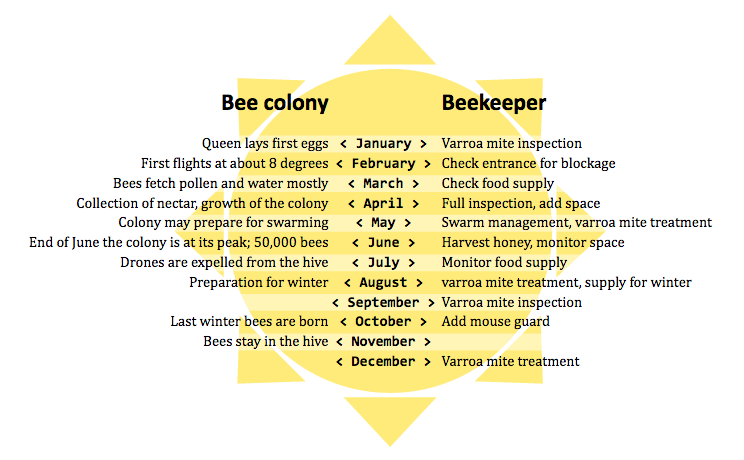 Here below an overview of digital beehive monitoring parameters. The total weight is the hive (constant unless the beekeeper changes anything) plus frames with beewax, nectar, pollen, brood and honey and the bees itself. Weight drastically increased with full on honey production. Weight will decrease slightly at night when all bees are in, eating some and evaporating water from nectar to produce honey. Monitoring weight can help determine if there is enough space left. If not, the bees may swarm or leave the hive. During winter, the it helps to determine if there is enough food stock left to start up expansion of the colony early in the year. If the weight suddenly drops several kilograms, a nearby colony may be stealing nectar or honey stock or wax moths or mice may be eating their way through the hive. 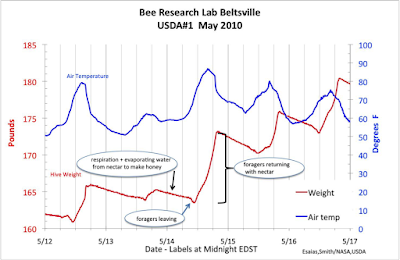 When multiple hives in the same location are being monitored, the pattern comparison can highlight anomalies. Both outside and brood temperature are important. Outside temperature indicates if the bees can fly. In combination with flight activity monitoring, one can check if behaviour is normal. Temperature measurement in the brood indicates bee health; keeping a steady temperature of 34 degrees by heating it up in winter and cooling it down in summer. The first check a beekeeper on a typical inspection, is visually check the flight deck; the arrival and departure strip for the bees. Are they flying for their foraging trips, is pollen coming in (nectar is harder to see), any abnormal behaviour or signs? A webcam can help to check the flight deck, but it will not interpret for you what it’s seeing (not yet that is). Measuring motion activity at the entrance in combination with other factors (rain, wind, light) is an indication of the health of the colony. The frequency at which bees flap their wings determines the sound frequency in the hive. For example when you expect they are fanning too cool the hive. When a bee colony is getting ready to swarm there will be a number of bees ‘starting up’ the rest of the the colony. Their sound pattern can be compared with a F1 wagon warming up. When this sound pattern is detected the beekeeper will want to take action soon to keep them in hive. Other uses of sound are to detect if the colony is without a queen; they sound ‘low’. Furthermore, queen bees which are about the hatch ‘toot’ and ‘quack’ to each other. A sound sample here. Note; bees can't hear sounds, but can feel vibrations. With strong winds or with rain, bees won’t likely fly out. So in combination with flight activity one can check normal behaviour. Update 7 March 2018: Based on this blog an initiative started called Beep, bee app. See: beep.nl. Hereby a go at a map visualisation of beehives in Breukelen and surrounding, basically North-West of Utrecht. Larger points indicate the number of hives and the circles indicate the approximate radius (1 km) where the bees fly out to collect nectar and pollen. The information is in Dutch. Click here to acces the map full-page. There's a form you can use to share another location in the Breukelen, Loenen, Utrecht area. A large map of beehives and beekeepers is http://apiarymap.com/. On January 20th 2015, my colleague Alvaro de Salvo shared the raw data file of the timeline of Akvo 2006-2014 in a blog post. Here my go at using the data for some visualizations for which I used 'RAW'. Click the image to enlarge. Bump Chart on the count on news categories, per year. 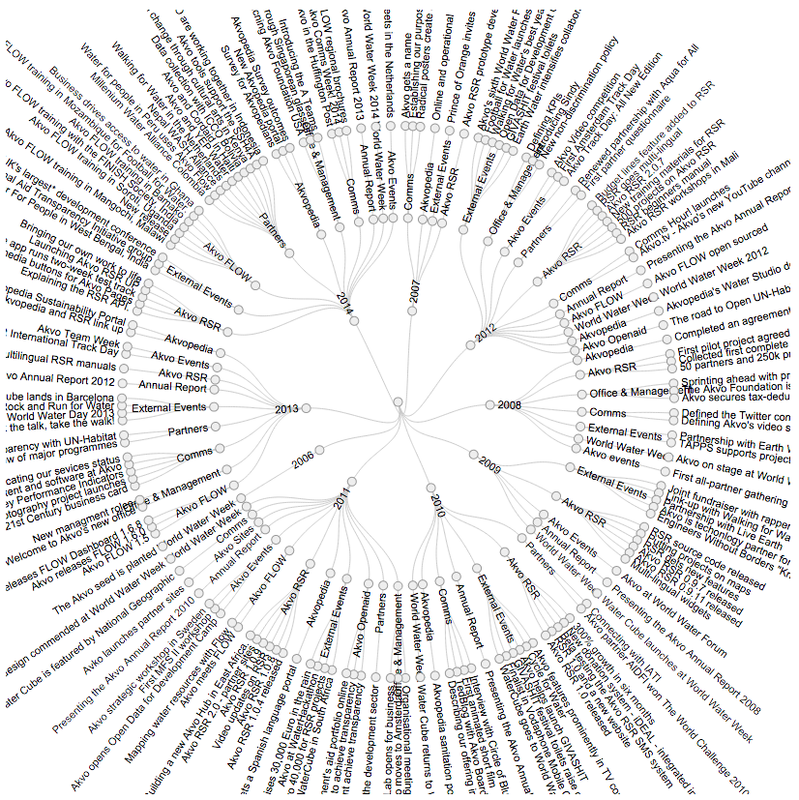 Circular dendrogram of news items except funding per category per year. 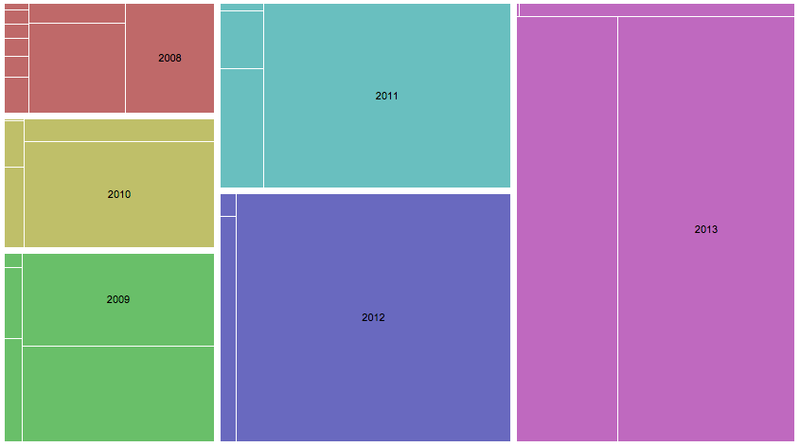 Treemap of the income per year. The subdivision per year indicate the size of various income sources. There are four main content types: text, image, audio and video. Using readily available tools we can easily convert content between the four types, making the content available to a wider (e.g. tv and radio) or a specific (e.g. text based when equipment is absent) audience. Text - People who are literate can read text or people can read text out to others (eg teachers or facilitators to a class or group). Typical examples of text are books and newspaper articles. Text can also be in digital form such as website texts. Often images are added to texts to illustrate the story or to visually explain something. Image - these can be of various types e.g. photographs and drawings. One does not need to be literate to understand images. The same is true for audio and video. Images are a visual means, literally to show something. Images can tell a powerful and convincing story, especially when the viewer can identify with the images, e.g. their area, their people, their issues and solutions. When an image stirs an emotional reaction they can be particularly persuasive to an audience. Audio - when text is recorded and played to others,e.g. via radio, we call it audio. Audio is the content type, radio is, in this case, the channel. Audio can have a larger impact when it is followed by debate e.g. via radio (audio) listening groups. Radio is not the only channel audio can be used on. It can be recorded and played on audio recorders and most modern mobile phones, tablets and laptops have audio recording and playback features. TEXT>AUDIO You need to record the text and for that you need to use a suitable voice and a device to record with. Mobiles, tablets and laptop and some desktop computers have a built-in voice recorders, so you do not need to buy a separate device. The voice to record the text with needs to be very clear and preferably without accent. Also, he/she should talk clearly and not too fast. You might need to record several times before the recording is of good quality. Make sure there are no background noises, if possible, if you have one, use a microphone (mobile phone headsets often have a microphone). Save the file (preferably as mp3 file) and done! You can either play the audio to a group, hand it to a radio station or use it to make a video; see AUDIO>VIDEO here below. TEXT>IMAGE Think about the essence of the story; what is it about, what is the message? There are several (easy) ways to convert text into an image: make a drawing, take a photo or ask an artist to create an image. Often text and images are combined; think for example of poster with a image that captures the essence of the poster, but the poster also contains text to promote an event, raise awareness on an issue, etc. TEXT>VIDEO To convert text to video we need images (video consists of a set of "still images" or "frames") and audio. So to convert text to video we need to convert it to images and audio first. A whole different approach can be to record a fresh video from the text. This can be done with a video recorder (on mobile phones, tablets and laptops) whereby someone reads out the text and the person is recorded doing so. AUDIO>TEXT When we have an audio recording such as a radio broadcast, we can convert it to text by writing down the words. As radio is a live broadcast we might need to record it first with a audio or voice recorder. The process of converting audio to text is called transcription. AUDIO>IMAGE We can do this in two steps: AUDIO>TEXT and then TEXT>IMAGE. AUDIO>VIDEO Video is a combination of (a set of) images and audio. So if we have the audio available we just need to add the images. The simplest form of creating video is to take a set of images (drawings, photos, etc.) and create a video slideshow out of it. Popular software to do this is Windows movie maker. IMAGE>TEXT There are many types of images. For this conversion we need to find out what the image is telling us, or what we want it to show to the audience. We might need to investigate the background to the image (e.g. the story of the person in a photo). When you write down the story, you have the text version. IMAGE>AUDIO For this conversion we need to first convert the IMAGE>TEXT and then TEXT>AUDIO. IMAGE>VIDEO As described above under AUDIO>VIDEO we will combine images with audio to create video. The simplest form is to create a video slideshow with a set of images. A more complex and time consuming methods are animation (cartoon) videos. VIDEO>TEXT This is the same transcription process as with AUDIO>TEXT. VIDEO>AUDIO Video has an image and an audio track. By isolating the audio track and saving that separately on our computer, we can convert video to audio. This can be done with most video editing software tools. VIDEO>IMAGE Similar to the previous conversion (VIDEO>AUDIO) we can extract images from video. These are called "stills" or "frames". On computers it can also be realised by making screenshots. To create a good quality (still) image with sharp enough quality you might need to fiddle around and try a few times. Video: Windows movie maker or Youtube Video Editor. Videos can nowadays also be easily edited on mobile phones on both Android and Apple.